Fireworks have become almost as American as apple pie. On July 4th, families flock to parks, lakes, and lookout spots to view the exciting conflagration of red, white, and blue. 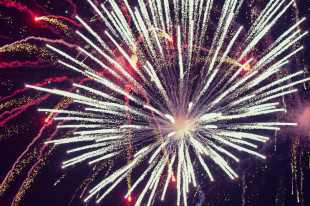 However, while the rest of us are celebrating with watermelons and barbequed burgers, web designers are celebrating with a different kind of Fireworks. With web content growing exponentially since the dot com boom, maybe you have wondered how to design or edit your own website. Many graphic design projects are outsourced, so graphics skills are a valuable asset on a resume. Instead of hiring an external person to do the designing footwork, what better way to celebrate Independence Day than by mastering this skill yourself? Adobe Fireworks was originally developed for rapidly creating website prototypes and integrates other adobe products, like Dreamweaver and Flash, to design beautiful interfaces and content. You can make your own fireworks with Adobe Fireworks. Both vector editors and bitmap editors are great for graphics. Vector editors, such as Illustrator, are better for typography, logos, technical and sharp-edged illustrations, and diagramming. Likewise, bitmap editors, such as Photoshop, are better for hand drawings, retouching, and photo-realistic illustrations. Adobe Fireworks has both of these capabilities and allows the user to edit images interactively and save them in a vector graphics format. With Adobe Fireworks, you can optimize your user interface with animated images, slide show, and other graphics. Designers love Fireworks because it uniquely approaches page-based stateful interactive design and rapid prototyping, which is essential to the design process. Many companies hire web designers based on their portfolio, so real-world experience and projects are often just as valuable as formal training. All you need is an understanding of your tools and a desire to design. Atomic Training offers several accessible DIY Adobe Fireworks courses on OpenSesame to help you become a designing pro in just a few hours. While there may be tradeoffs between formal training and self-directed training when it comes to web design, the proof is in the projects. eLearning courses can also be helpful as a supplement to formal training; even if you have taken classes or met with teachers, training courses include helpful demonstrations and additional resources. Perhaps you are interested in other web design tools. Atomic Training offers an entire bundle of courses that explain Photoshop, Illustrator, and InDesign. These three products explore a range of skills designers can use beyond Adobe Fireworks including more detailed image editing, video editing, and more. With these tools you can develop creative content, hone existing content, and employ clever editing and design techniques. So celebrate the essence of Independence Day by practicing your independence as a designer. Learn to implement creative ideas, or gain inspiration from this selection of helpful training courses from OpenSesame. Who knows, maybe instead of barbeque duty, you will get to design the next big 4th of July poster or web page. The burgers will be gone in minutes, but your creative content will last every year for America’s birthday (and beyond! ).